Mandan red flour corn grown by many generations of Mandan agriculturalists and raised in the Science Museum of Minnesota’s Big Back Yard. 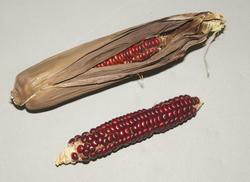 The ear of corn on top is about 65 years old and the other was grown here at the museum in the Big Back Yard in 2005. People might think of “Indian Corn” as a single type of corn with speckled kernels of many colors. Actually, all corn is “Indian Corn.” In 1977, the Wesley Hiller Estate donated an entire collection of Native American seeds to the Science Museum of Minnesota. The ethnobotany project in the gardens of the Big Back Year, has stabilized, revitalized and grown the seeds to continue the genetic viability of this heritage corn for future generations.